Baltimore, MD, USA: Mount Baldy, a sand dune in Indiana Dunes National Lakeshore (http://www.nps.gov/indu/planyourvisit/mt-baldy.htm), may appear to be no more than an innocent pile of sand grains speckled with vegetation, but the rolling slopes hide narrow, deep holes, which are evidence of entombed oak trees. No one knew the holes under Mount Baldy existed until a six-year-old boy fell into one in the summer of 2013 and was buried. Emergency responders successfully rescued the boy after three and a half hours (Read more in Smithsonian [http://www.smithsonianmag.com/science-nature/mystery-why-dangerous-sand-dune-swallowed-boy-180953404/?no-ist]), but the accident left Indiana University Northwest coastal geologist Erin Argyilan, who was there at the time, struck by the concept that deep, stable holes could form and survive in loose sand. The subsequent study by Argyilan and her co-authors, which will be presented at the Geological Society of America meeting on Tuesday in Baltimore, Maryland, concludes that the holes formed when trees, buried by wind-blown sands, rotted away. A cement formed by fungi-produced minerals and chemical weathering lines the walls of the hole and temporarily maintains the branching shape of the tree hollows. "These are living systems. There is a real interaction between biologic and geologic properties," said Argyilan. "We have to look at these dunes with an interdisciplinary mindset or we will miss how the system works." Scientists know Mount Baldy is on the move. Geologists estimate that winds shift the crescent-shaped dune, which reaches 38 meters (126 feet) above the south shore of Lake Michigan, roughly 1.0-1.2 meters (3-4 feet) inland a year, although the actual movement is highly variable. Blowing sands overwhelm and bury vegetation, buildings and parking lots on the dune's windward side, and the tree hollows are being exhumed on the hill’s leeward slope. 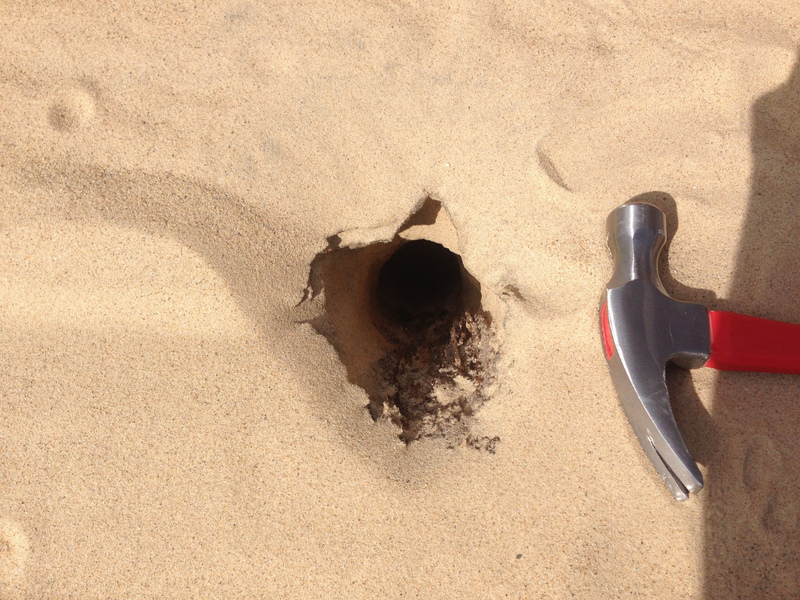 To learn how Mount Baldy's holes formed, the team first had to find some holes. Park Service personnel spotted some, while the Indiana Geological Survey (https://gsa.confex.com/gsa/2015AM/webprogram/Paper268209.html) used ground-penetrating radar to search for others. Argyilan and her colleagues even found one or two using paintbrushes and trowels. At one point they even found a fungus-ridden oak limb that terminated in a tree-shaped hollow. "At that point, I was sold that we had trees being buried and decomposition driven by fungus," said Argyilan. "But I did not know why the holes would stay open." The scientists turned to scanning electron microscopy, which helps ascertain the surface texture and chemistry of minerals. Not only were the walls of the tunnels littered with hyphae, the equivalent of fungal roots, but they also were covered with a cementing mineral. Fungi were likely living inside the trees prior to the plants' burial. Once the trees were entombed, the fungi decomposed the tree, and the long-lasting cement maintained the structural integrity of the hollow even after the tree had decomposed, according to the study. The cement is a byproduct of the fungal decomposition process and the result of chemical weathering, but the scientists are still studying the precise biological and chemical pathways that form the cement. "The next step is to examine how involved the fungi are in creating the cement," said Argyilan. Since starting to explore Mount Baldy's holes, Argyilan has learned of similar holes in Oregon coast dunes and at two other locations along the Great Lakes. The Oregon dunes appear to have been caused by smaller trees compared to the oaks at Mount Baldy. "The oaks make significantly more hazardous holes," said Argyilan, "especially when you can't see them from the surface." Scientists have identified eleven holes on Mount Baldy, but Argyilan suspects they will find more as the dune migrates, partially the result of human activity in the area. A local harbor blocks sands from reaching the dune, while historic mining and tourists have eroded the dune's sandy slopes. Erosion has also increased during winter; shrinking lake ice -- a product of climate change -- does not protect the dune from winter winds as it has in the past. "What's happening at Mount Baldy is basically the perfect storm for destroying and reactivating [the movement of] a dune," said Argyilan. "Here, and in general, I think it is a real possibility that we will see more holes as more dunes are reactivated by human activity." Example of a hole in Mount Baldy — all that remains of a buried oak. Photo courtesy Erin Argyilan. Click on the image for a larger version; a higher-resolution photo is available upon request. Northern California, USA. Image courtesy NASA. 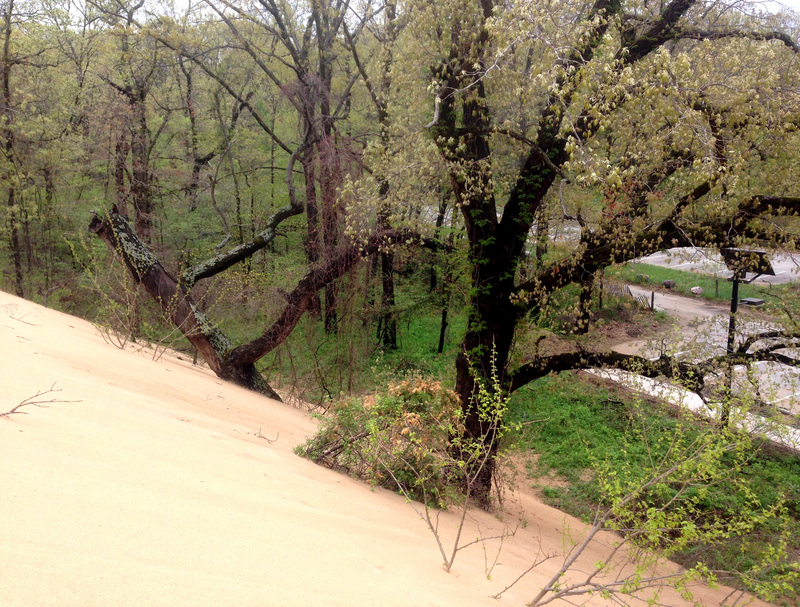 Mount Baldy, a sand dune in Indiana Dunes National Lakeshore, is migrating inland, covering trees, buildings and parking lots as it shifts. Photo courtesy Erin Argyilan. Click on the image for a larger version; a higher-resolution photo is available upon request.